Apartamento limpo e bem conservado, a poucos metros do lago, com janelas panorâmicas e uma agradável sala de estar com TV de 40 ". Grande solário onde você pode relaxar e tomar sol em completa tranquilidade. Adjacente à cidade de Iseo, onde você pode encontrar belos restaurantes, lojas e pubs no lago, onde você pode passar belos dias na empresa. Com a possibilidade de visitas às adegas da famosa Franciacorta onde pode saborear vinhos de prestígio. Our apartment had a balcony with a nice view of the Lake. We had the First (euro) Floor Apartment. There is also a Second Floor Unit above us, and a house with gated grounds adjacent. Our apartment seems to have been remodeled recently. So everything was nice and new. Mary, our host, was very pleasant; she really wanted us to enjoy our stay. For future travelers, the building is located on the lake side of the railroad tracks (not actually on Via Covelo). It is very near "Camping Covelo", and enjoys a cooperative relationship with the campgrounds. You can have any meal at their restaurant (seated inside or outside). Reasonably priced. We had dinner there one night, and were surprised at how good it was. Herrlicher Blick auf den See. Sehr schöne Wohnung mit Blick auf den See. Ruhig gelegen. Die Bahn, die vorbei fährt, ist nur tagsüber in Betrieb. Zu Fuß ist man in 20 Minuten in Iseo. Die Wohnung ist groß und hat alles was eine Ferienwohnung braucht. Unsere SUP's konnten wir in der Garage direkt neben dem Eingang lagern. Die Vermieterin und ihr Mann waren sehr freundlich. Perfect, clean home just a few steps from the Lake! We were a group of 5 people. The house was definitely big enough for us all. Our host Mary was very friendly and accommodated all of our needs. 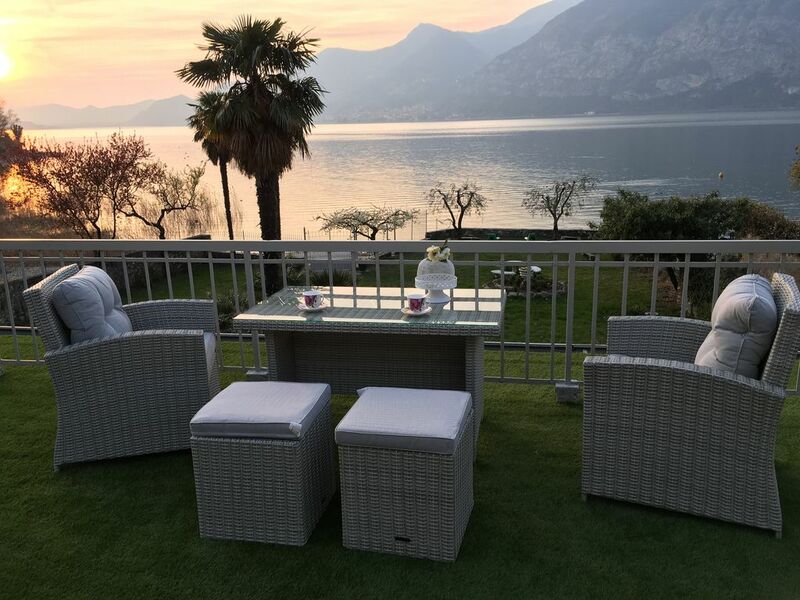 The home features a very generously sized terrace with sun loungers and seating and great views to the Lake and stunning sunsets.There is direct access to the lake for swimming and kayaking. There was nothing to complain about! A casa está localizada perto da cidade de Brescia e Bergamo onde encontrar lugares ė uma hora de Milão, perto da Expo.